Google+ (sometimes written as Google Plus) is among the finest emerging Social Networking website of the year 2012 while Pinterest ends up being second. Google+ has more than 500 million users, which motivates a blogger to add a Small Google +1 button on his website. Whenever a visitor hits a +1 button, they are helping you to socialize your content, by distributing your content with their friends and family. However, sometimes users admire your content, but when it comes to sharing the content on the social web they fancy their chances and thus, ends up in not sharing. The great alternative of forcing your visitors to +1 your content is to use Google+ Traffic POP that does the job uninterruptedly. 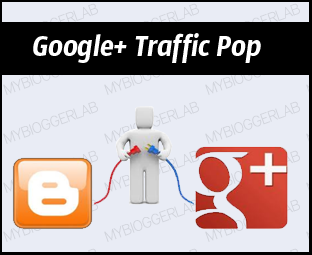 Therefore, today in this article, we will Learn How to Add a Google+ Traffic POP in Blogger BlogSpot. In the past, we had released many Social Traffic Pops, which had some most popular social buttons i.e. Facebook and Twitter. Similarly, this time the concept is not new because we have just replaced the two other Social sites with Google+. We have also added a Timer, now if a visitor wants to access your site he either have to like subscribe or have to wait until the timer reaches the zero. Traffic POP: It is a kind of a widget that pops up, whenever a visitor arrives on your website. It blocks access the whole website until a visitors share your site on any of the mentioned social sites. Consider the following screenshot to see how a Traffic POP looks like. We have kept the steps extremely straightforward so that anyone can easily apply them on any kind of website. Yes, it works on almost all platforms. However, since, we promote Blogger Platform. Therefore, the following instruction only applies on Blogger Platform. Replace http://www.mybloggerlab.com with any URL that you want. Remember: This would be the URL which will receive all the +1's from your visitors. If anyone desire to increase the seconds of the timer then, he can replace 30 accordingly. Remember: The extension of the timer is in Seconds. That's all, now visitors have to +1 your site or they have to wait until the timers finishes. Since, this gadget catches the history. Therefore, after doing a +1 it will appear anymore. However, after removing history or clearing cache it will again start appearing. facebook ka bhii asii ek popup code hota hai nah ? want to remove powered by MyBloggerLab then what to do? Check is it working Fine ? Thanks Hamid, For liking ;). great work Faizan, but i think one thingyou must add in it, and that is the close button, without close button, it will irritate visitors. thanks.. installed.. will it effect speed? But it irritates people while surfing your blog first time and like to close your blog instead of closing or +1 the your blog. I Think You Didn't Read the Tutorial Properly. We have Disabled the Close Button initially,However, you can Enabled it as we have mentioned in the Steps. Its All About Socializing. Those peoples who really want to visit your site, The real ones would never ever close your site without reading your precious content. Depends how well your sites reputation is. And you are not able to see the POP Because you have +1d your site. However, it would continue to appear to those who haven't +1d your site yet. Peace man! No, It won't affect a Great deal. No, it doesn't worked for me! I logged out and still it don't appear. I logged in with another account (which i haven't given +1) and still it continues. And for site down, it is hosted on blogger (google) so it cannot be down. Whenever you see my site down, check it using isup.me and please click a screenshot of it and email me. @Syed Faizan ali ! You have added two description meta tags in your blog, isn't wrong for Google crawler to find same description tags in your blogger? Hey Guys and girls! Syed you too! Guess what? I have got a surprise for you! Check This!! You would be really amazed Syed! I think there is a problem.For example if you click a post it appears every time .How can I fix it? Yup, it will keep on appearing until your visitors would not +1 your Site. Once, you have +1d it. The widget would stop showing. In fact it will never going to appear again to a certain visitor. Is there any way to prevent to appear every time ?